Louise Gornall tells the story of 17-year-old Nora, who has a major mental illness. She has not been able to leave her house for 4 years, due to a sudden onset of agoraphobia when she was 13. She also has crippling obsessive-compulsive disorder which makes her perform rituals, need activities to be done in even numbers, require symmetry in appearance, and avoid contact with other humans in case of contamination by germs. Surprisingly, it seems that she does not have hand-washing rituals. Nora's anxiety is so severe that she sometimes loses consciousness at moments when it is especially acute. Nora lives with her mother and mostly keeps in good spirits, which is strange given that she isn’t able to experience most of the pleasures and excitements that other teenagers can have. That is partly due to the help of her psychiatrist, who gives her medication and psychotherapy. It also a lot to do with her loving mother, who devotes an enormous amount of time catering to Nora's many special needs. We learn all these details as the main plot of Under Rose-Tainted Skies develops. The novel starts with Nora's mother departing for a conference, leaving her daughter alone for a few days. And at the same time, a new family move in very close by, and Nora notices a good looking young man, whose name is Luke. We might think that he would have no interest in Nora given her extreme limitations, but she is both good looking and charming in her own way. She is the narrator of the story and she has plenty of self-awareness plus a nice sense of humor. She and Luke form a connection over the coming days, but she has to gradually reveal to him the extent of her problems, which is extremely difficult for Nora. Needless to say, there are trials and tribulations along the way, and at several points she is sure that he will never talk to her again. In some ways this is a fairly standard teen romance, but with a major theme of mental illness. What Gornal does well is highlight the difficulty for Nora of coming to accept who she is. There is some chance she can get her fears under control enough to eventually leave her house, but there's no guarantee. It's very likely that she will be grappling with her problems for the rest of her life. So there's a genuine question why Luke would want to be her boyfriend when she can hardly stand to touch him and they can never go anywhere. She wants Luke not to judge her for her problems, and he does admire her bravery. Nevertheless, it is difficult to grasp the idea that he can see past all of her irrational fears and odd rituals to see the person she really is, when her fears and rituals are so deeply ingrained that they seem very much part of who she is. 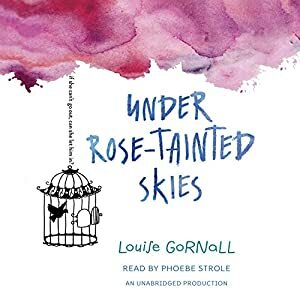 Under Rose-Tainted Skies ends on an uplifting note with some hope, but it is a little rushed, providing no clear path to seeing how the relationship between the two young people could be one that lasts. The book gives some indication of how difficult it is to live with agoraphobia and OCD, or at least with one version of that combination. It is pretty good at explaining some of the psychiatric terminology and the treatments Nora has. So it has educational value and could be helpful for teens who experience similar problems, or for people who know them. The writing is lively and the story, which is not burdened with much complexity, keeps moving at a brisk pace. Phoebe Strole reads the unabridged audiobook giving Nora a perky personality and also conveying some of her emotional range without making her too bizarre. It's a strong performance.